High-quality outdoor nylon POW MIA flag for sale. Our POW/MIA flags are fully dyed for great outdoor performance. 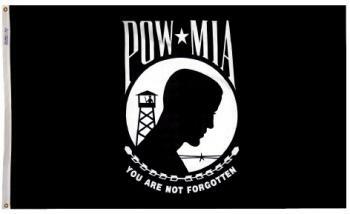 The POW flag for sale here is DOUBLE SIDED so the image shows correctly on both sides. Four rows of stitching on the fly end make our POW/MIA Flags durable in all conditions. POW/MIA Flags are finished with a canvas header and two brass grommets. This Prisoner of War Flag is proudly made in the USA.